Jan2016: 2016 has got off to an absolutely cracking start. Stu Hunter’s new Epic suite The Migration was launched at the Sydney Festival on Jan 9th. Andrea Keller, Sam Anning and I debuted the new Transients Trio at Lazarus Lane. Zac Hurren and I toured Australia playing music from David Ades’ A LIFE IN A DAY, the first album to be released on Lionsharecords that doesn’t feature one of my own groups. There was some great press for Dave’s album and the gigs that I’ve placed in the news section below including a 5star CD review from the Sydney Morning Herald, a CD review from DowntownMusicGallery in New York, live reviews from the SMH, The Age and Adelaide Advertiser and editorials by Melbourne International Jazz Festival, JazzAustralia and the ByronBay Echo. Speaking of 5star reviews Jazz.org just published one for my latest quartet album This Narrow Isthmus. It’s being officially launched in March on the opening night of the Inaugural St Kilda Summer Jazz Festival. On top of that, Barney McAll played his first ASIO show as a Melbourne resident at Paris Cat and Virus Quintet have a new residency south of the river on Sunday afternoons from 3-6 at a great little restaurant called Osti. Lets hope the rest of the year can keep up with all the excitement! Nov2015: The follow up album to This Is Always has just been released. Recorded live in Sydney, This Narrow Isthmus is now available on CD and as a 24bit download. 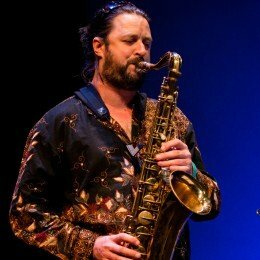 Australian alto sax legend David Ades’ final album A Life In A Day has been released concurrently through Lionsharecords. It features an 8 page booklet with liner notes, photos and art by Dave’s family and friends.